This guide is for everyone who knows that it’s important to start investing but isn’t sure how to do it right. Investing can feel complicated, intimidating, and overwhelming. There are strange new words to learn, a million decisions to make, and a whole lot of uncertainty about whether you’ll make money or lose it. It’s normal to be scared of investing. In fact, it’s normal to be so scared of investing that you avoid it entirely. But here’s the thing: investing doesn’t have to be scary, or complicated, or difficult. It can actually be pretty simple if you know what’s important and what isn’t. Which decisions matter and which don’t. You can create an investment plan that helps you reach your goals, no matter where you’re starting from. This guide will show you how to do it. This is an action-oriented guide. There’s plenty of explanation so that you know the WHY behind the decisions you’re making, but first and foremost this guide is meant to show you exactly HOW to put your investment plan in place, step-by-step from start to finish. Re-thinking retirement – The traditional view of retirement is outdated. You’ll learn how to think about it in a new way that not only opens up new opportunities, but increases your odds of investment success. Purposeful goal setting – Your investment plan is only as good as the goals you’re working towards. You’ll work through an 8-step process that helps you set concrete goals you can actually achieve, centered around your values and the life you’d like to create for you and your family. Setting a savings target – No more guessing at how much you should save or whether you’re on the right track. You’ll calculate a specific monthly savings target based on your personal goals and situation AND create a plan to get there over time if you can’t hit it right away. Choosing the right investment accounts – You have a lot of options when it comes to retirement accounts and choosing between them can be confusing. You’ll learn exactly which retirement accounts are best for you and how to spread your contributions among them. Evidence-based investing – If you’re looking for the next hot stock tip, you’re in the wrong place. 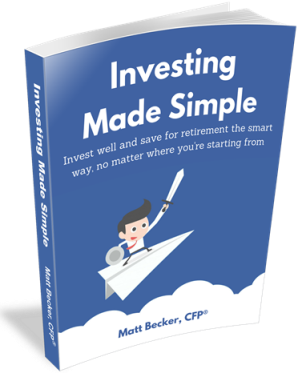 This guide teaches you how to invest in a way that’s both simple and backed up by decades of research. Choosing the right investments – You’ll learn how to choose specific investments within each of your retirement accounts. There are even lists of real mutual funds and ETFs you could choose to implement your strategy. Maintaining your plan – Putting your plan in place is just the first step. You’ll also learn how to track your progress and make sure everything stays on track over the years. Investment Plan Workbook – A workbook to help you organize and record the specifics of your investment plan as you work through the guide. Savings Calculator – The same spreadsheet I use with clients to calculate a monthly retirement savings goal. Asset Allocation Tool – The same tool I use with clients to help determine their target asset allocation. It’s only $19 and I offer a 100% money back guarantee with no expiration date. If you’re not happy with the guide, all you have to do is ask for a refund and you’ll get it, no questions asked. Traditional vs. Roth IRA – A detailed breakdown comparing the pros of each account, including some unconventional wisdom you won’t find almost anywhere else. The Backdoor Roth IRA – If you’re a high earner, you may have heard that you can’t contribute to an IRA. But there’s actually a way around those limits that allows you to get tax-free money in retirement, no matter how much you make right now. The Mega Backdoor Roth IRA – Though rare, this is a way to potentially contribute tens of thousands of dollars to a Roth IRA every single year, no matter how much money you make. The 5 Best Retirement Accounts for the Self-Employed – If you have any self-employment income, even if it’s just a little money on the side, this guide will help you find the right retirement account for that money. How to Find a Good Health Savings Account – A health savings accounts is the best retirement account you’ve never heard of. It’s actually the ONLY one that lets you save money completely tax-free. But finding a good one can be difficult. This guide explains the steps I took to find the best health savings account for my personal needs. Why All My Investments Are With Vanguard – My wife and I have all our investments with Vanguard. IRAs. College savings accounts. Regular investment accounts. They’re all there and they’re all invested in Vanguard funds. This explains why.